I was born a twin to artist Mother and Father, she a painting teacher, he an entertainer. My sister and I grew up in Southern California, but spent summers in the mountains, and knew that we would someday live in the land of tall evergreens. I learned collage from my best friend, Via, a professional collage artist, in northern California twenty-some years ago. Via held a class on collaging, and I wholeheartedly embraced the idea (except for the very sticky hands). I had worked with fabrics for years, with appliqué and quilting, and creating wearable art. Collage was a different way to accomplish what I wanted to do, create a space where my intentions were exhibited in a wonderful and inventive way. 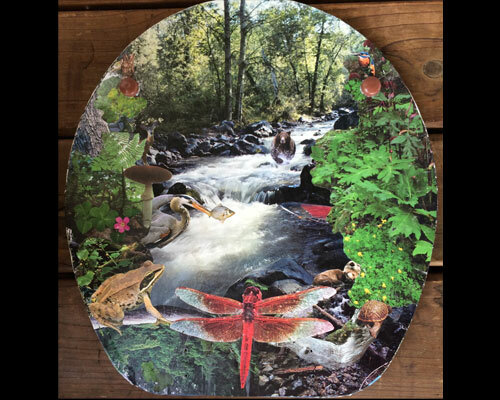 Several years later another good friend, Becki, taught me how to collage on 3-dimensional objects such as trays, boxes, furniture, and even toilet seats. My collages are also available in the form of greeting cards. In many of my collages I tuck a turtle, my totem. Since childhood I have loved turtles, hence my art business name, Tortuga Art, Spanish for turtle. Along with my love of juxtaposition, I enjoy photography, beading, gardening and preserving food, reading, drawing, dancing, biking, and hiking in my southern rural Oregon home, and my southern rural Baja Mexico home. I have exhibited my art at Taylor’s Country Store & Deli, Eyecare Group, Bebe’s Art for Everyone, Cabin Chemistry and Bagel Junction, all in Cave Junction, Oregon. My work is available at the Southern Oregon Guild Gallery in Kerby, Oregon.